Jeff recently enjoyed a hunting trip with friends, staying at a lodge in Texas that belongs to one of them. 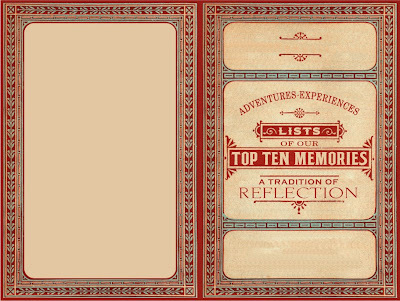 As a thank-you to his host, he sent a top ten list of their adventure as experienced by him. Naturally, it was quite well received. 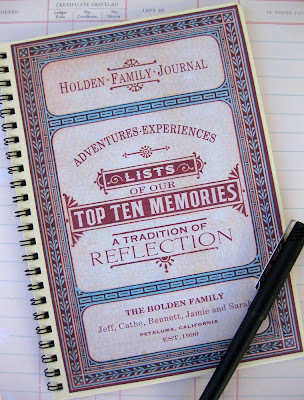 Jeff suggested that we as a family keep a top ten notebook of our family experiences, with each of us writing our own list per adventure, beginning with our latest camping trip to Lake Pillsbury. This is such a great idea -as I am not a scrapbooker or journaler- and unless we start writing this stuff down, it could be lost forever. 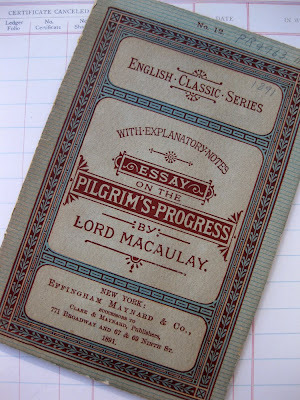 I found this wonderful little 1891 booklet at the thrift store for $2 just the other day and thought it would make the perfect layout for our first book. I scanned the booklet, pumped up the volume a bit for the color, Photoshopped out the existing wording then added my own. I picked up the simple spiral notebook at our local bookstore and with spray adhesive, laminated the new covers to the front and back. Below are JPG images of the covers for you to use either for your own top ten lists or for other fun projects. Save image to your computer, reduce to size and add your own text. UPDATE: Check out what Sarah Nielson of The Lighbulb Lab did with these images! Wow!! This entry was posted in Uncategorized and tagged Family Journaling, Free digital downloads, Top Ten Lists, Vintage Free Clip Art, Vintage Ornate Frame. Bookmark the permalink. What a GREAT idea! I wish I had gotten this one years ago. You are right, if you don't write it down it is gone forever. Thank you so very much! Really nice – I love this. Thanks for sharing it for others to use! SO wonderful! Do you have a really high-quality printer for projects like this? What do you use? I assume you print at home. I just use a basic Epson Stylus NX400 purchased from Best Buy. Nothing fancy, wouldn't mind having something a bit nicer, but it works fine for my little projects. This is awesome, Cathe! I'd love to create a look-book with this cover. Thank you! Thanks for the wonderful idea and images. I think this would make a great project for my eighth graders when they study Life on the Plains next year. What a terrific idea, Cathe! And, once again you're sharing the art of it! Thank you! Thanks so much for sharing. Your family is so creative and your husband is a really thoughful guest!! Great idea. Thanks! We are visiting some friends this weekend and what a neat thank you gift this would be! Have a great day! You did a fabulous job on this. You are very generous for sharing it with everyone. I love this. Thank you so much for sharing it with us! Love it, amazing, thanks for sharing!! I LOVE this! I am going to use this idea for our family reunion over Labor Day. It would be fun to have the kids records their favorite memories of the reunion and then read them all together as a family on the last night. Super cool idea…I want to be in your family! 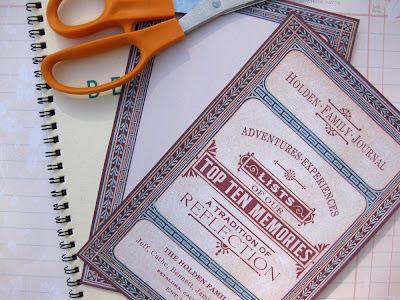 Between the sharpie tattoos and your reflection journal – just so fun! Love this! Thanks for the cover of our summer's journal. Bless you for this! I have saved volumes of the cute, smart, funny, outrageous, etc. things my grandchildren have said from the time they could talk. Now, they are all grown, and I have been searching for a clever idea to put them in book form – with a personalized cover for each one. Thank you for your generosity. This is perfect to put on the coffee table for easy access! Thanks! We call it a Happy Book at our house. It even has a happy book creed! You just make a list (and they don't all have to be happy things…just memorable) Ten makes a good number. It's is wonderful and surprising when you read the list a year or two later because these great memories come flooding back. Thanks, Cathe! Thanks so much for sharing this with us. Saved it in a folder for a future project. You did a great job on this. This is terrific! You are so creative! We will certainly be doing this. Thanks for the template. I'm just starting a journal so i'm using it for a cover. Always love your ideas. I love this idea. As usual, it's classy and well-made. Top 10 lists for life's experiences are a good idea too! I am a notebook collector! These are great! Cathi, Thank you, again, for the lovely post on the birds nests. I just want to make more and more. I posted some of the pics of the jewelry I made from your sweet post. I am having toooo much fun! This is stunning! Thanks for your generosity! You are a wonderful generous artists! Thank you so much!!! Cathe, I love it! What is the font that you used for your cover? This is wonderful! How did I miss this??? LOVE it, I am so totally going to use this for some fabulous Christmas gifts… thank you so much for sharing! I used this for my Christmas card this year – a flat 5 by 7 with our top ten memories from 2009 printed on the back. Thank you for sharing! WOW, this is SO cool! Our local library has a book sale twice a year and there's always a corner of weird old books like this! Thank you for sharing this awesome idea and graphics! Absolutely ADORE this – thank you so much for continuously sharing so many amazing vintage finds after turning them into free printables! You’re a never-ending source of inspiration!!! Love it! What an serendipitous find and how clever of you to think of adapting it to your family adventures! I may use the idea myself for our next adventure! I have always found scrapping travels and grandchildren the easiest of subjects. But as I have so many scrapbooks laying around, and lots of folders of souvenirs and travel ephemera (from trips I didn’t get scrapped), that this year I decided to collage our Panama Canal Cruise onto canvas – a previously used 16×20 was perfect! And it was so much quicker to complete and so accessible because there it is hanging on the wall as a pleasant reminder!